As much as I embrace and appreciate new media in all of its diverse and chaotic forms (blogging, Twittering, and Facebooking), there’s a part of me that pines for the good ‘ol days of print media. With everything moving in a digital direction, I can’t help but miss the feel of good quality paper between my fingertips, the excitement of receiving a new issue in the mail, and the simplicity of sitting down with a magazine and giving it my undivided attention. Sure, I find pleasure in having ten windows open on my laptop and erratically switching from one website to the next, but there was something glorious about the recent past that I can’t seem to get over. On a recent trip to St. Louis, I re-experienced a thrill that I had abandoned sometime ago. Flipping through the gorgeous pages of Sauce Magazine, I felt giddy like a school girl. In a time when beloved publications are folding and talented journalists are being laid off, it was uplifting to read a magazine that seemed to not only be surviving, but truly thriving. 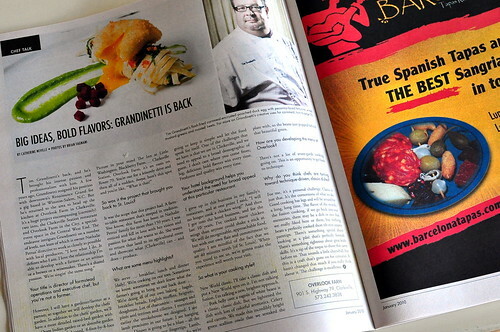 Sauce is St. Louis’ monthly food-focused magazine. It is available for free at nearly every eatery in town and highlights the city’s bounty. Sauce‘s pages are filled with restaurant reviews, seasonal recipes, chef interviews, ingredient breakdowns, and pertinent trends. It provides a window into the city’s belly. The writing is solid and all, but what I adore about the publication is it’s clean design and vibrant photography. The magazine’s paper and pixels are just a smidgen nicer than the daily newspaper, which means that colors really pop and the photos really shine. I think Sauce needs to come to Los Angeles. We’d rename it Salsa, of course. Sauce aka Salsa looks like something I wood read. You can start up a Southern Cal version! If you put your head & energies to it Catherine, I have faith in you one day being a publisher. I love seeing Vietnamese food going global. I especially love when ppl I meet, call the dish in its Vietnamese names. Makes me happy. Id love to get my hands on one of those “Sauce” magazines, it looks awesome! And free??? wow! Can’t believe the magazine is free. 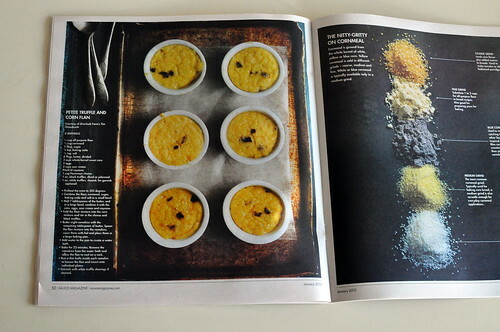 From the photos of it, it can easily be comparable to some of the national food publications. As a recent transplant to St. Louis, Sauce magazine and the plethora of independently owned restaurants in this area are something that I truly love about the STL! I live and St. Louis and love this publication! It is off the hook! I own every copy they have published. I await anxiously each month for a new issue!! Check out their website, it is well done and they have a great daily newsletter. I wholeheartedly agree. 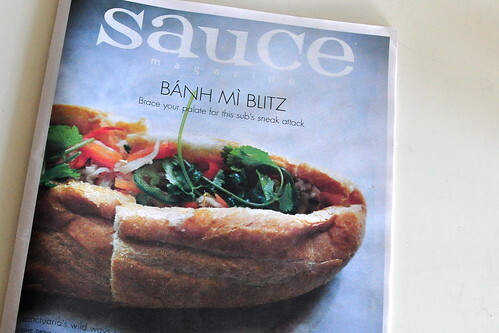 I was able to pick up two copies of that banh mi issue of Sauce Magazine when I was in STL in late December. Very good production values, great photography, good writing, solid ad sales and representation. It’s really a shame that LA can’t support a publication like that, but also consider the competition: LA Times, LA Weekly, Angeleno, LA Magazine, blogs, et al. If 10 writers and 5 photographers joined forces, I think we could produce enough content to put together a great publication like Sauce. Any millionaire investors who want to make a splash in the local restaurant industry? I’m on board! I have a love affair with actual printed media too, there’s nothing like sitting down and shutting down as I peruse a magazine’s splashy photos, well-written features and even the occasional catchy ad! 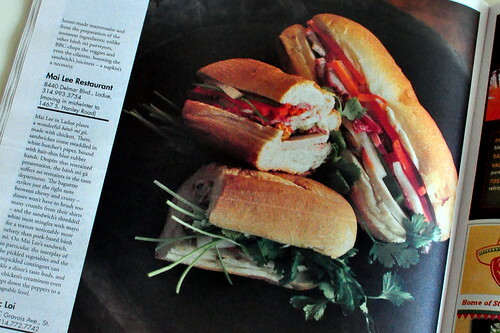 But it’s definitely interesting to envision what the ideal LA food magazine would be. With the wide diversity of eats available here, it’s hard to keep a focus to maintain consistency and reader loyalty — but keeping too narrow an emphasis to cover the plethora of different eats (high end, low end, ethnic, haute) is doing a disservice to the food community. I will never be able to give up my print newspapers and magazines. I love walking up to my front stoop after my morning jog to find the LA Times waiting for me. Reading it while I eat my breakfast is one of my favorite times of day. Well get ready! Sauce is coming soon. Changes have occurred at the magazine that bode so great for all us foodies! I live near St. Louis and don’t think the magazine is thriving. I have a friend who used to take pictures for it and was very underpaid. Photographers like some of the staff but say the management is a joke. Fun fact: the couple that was initially running Sauce together broke up, and half went off to team up with Lee Enterprises, the company that bought[/ran into the ground] the Post-Dispatch, to create Feast Magazine. 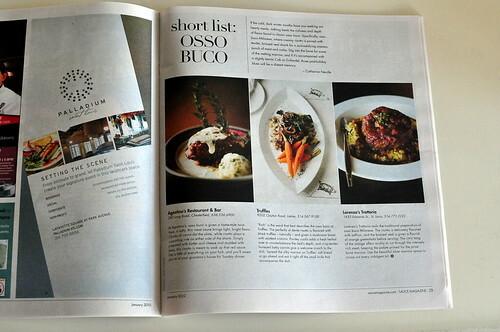 St. Louis now has two large, well-written, visually pleasing food and dining magazines. Feast and Sauce are largely the same stylistically (and both quite readable), but Feast seems to have more of an emphasis on the graphics and layout than Sauce does, and less emphasis on the writing/longer articles. Feast also seems to be shooting for an overall wealthier demographic — the must-have kitchen tools it lists are often outrageously expensive. They’re both worth picking up the next time that you’re in St. Louis! 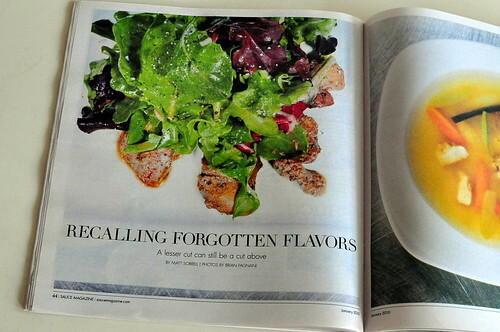 Who knew, St. Louis, a city with two high-quality food magazines. I blame the breakup and Lee wanting in on some of that sweet, sweet Sauce advertiser money. Ah yes, see the above link: Feast was almost definitely Catherine Neville’s “new venture.” I can’t speak to how the photographers are treated at either of them, but I wouldn’t take that RFT blog post as a sign of the turmoil of anything but Allyson and Catherine’s relationship. Both magazines seem very much to be thriving in 2011.